Welcome to the Circus! The Clown is on vacation and the Witch is filling in. Got an old dispenser stored away somewhere? Follow this basic tour to see if you can find clues about its age and value. Keep in mind this is just a primer, as the nuances of dispensers can get quite involved. For more detailed information about dispensers and collecting, Shawn Peterson’s Collector’s Guide To PEZ, 3rd Edition is a great resource. This ubiquitous part of the dispenser is most likely what comes to mind first, though character heads were actually not introduced until the late 1950s. Licensed characters - like Casper and Popeye - were introduced soon after. Many early dispensers - some with small parts - were actually painted or applied by "homeworkers." Hence, variations (including irregularities) are a sought-after aspect of vintage collecting. Small parts were eventually replaced by solid molded heads. The most well-known characters have evolved with changes to the animation, resulting in many versions of that chacter over time. Other identifiable variations include plastic, color, whether the head has a thumb tab, and copyright information linked to manufacturing year and location, just to name a few. Not all vintage stems are created equal, and variations abound. Even the raised P-E-Z lettering may differ, depending on age and the mold used (some are "shadowed," some are not). The textured pattern along the stem may differ also. Five different die-cut stems were made, i.e., those with cutouts that let you see through to the inner sleeve (Casper, on right). Others have raised logos or art: The original Witch has a flying broom. Notable promotional/product stems include the Cocoa Marsh Spaceman (included with the original drink mix), and Zorro (left) promoting the 1960s movie. Materials used vary according to age, including some stems with richer colors, a more translucent quality, or even a metallic finish (see the Cocoa Marsh below). The small area on one side of each dispenser that includes a country name and patent information tells a lot about where and when a dispenser as made (though exceptions abound). Many stems also have an IMC number on the upper corner that further indicates where it was molded. Some frequent vintage stems include Austria, Hungary, Slovenia, and Hong Kong. More rare stems include Brazil, Mexico, Spain, and the USA. Below left is a rare "double half- flower" stem from Yugoslavia, and a rare Deutches Bundes Patent stem (right). Read more here. The earliest patent # is 2.6, and the current is 7.9. Though patents can provide some idea of a dispenser’s age (relative to when it was issued), this is not a hard-and-fast rule. Some 2.6 patent stems - first issued in the 1950s - were still showing up on new dispensers in the 1970s! 4. "Non-Footed" and Footed PEZ. "Non-footed" refers to any dispenser made before 1987, the year when PEZ inc. began to attach "feet" for stability. Collectors recognize this as what separates "vintage" from "non-vintage" dispensers, and the terms "non-footed" (NF) and "vintage" are used interchangeably. With respect to post-1987 footed dispensers, there was actually a short transition period indicated by "thin footed" dispensers (center photo), compared to the thicker feet that followed. One significant difference with respect to the stem is that a footed dispenser has a more pronounced "raised" spine on the back, whereas a vintage, non-footed dispenser has shallow spines on both the front and back. There are some (rare) exceptions, of course, and its worth mentioning that common Valentine Hearts (right) don't have feet either. The inner-workings also have variations that collectors find appealing. These include the small tab or button that sits under the stack of candy itself, as well as the essential inner sleeve that cradles the candy: both essential parts for a functioning dispenser. Candy Buttons have changed in design and efficiency throughout the years (indicated by the successive patents), and so have their colors and shapes; a square shape has evolved into a button with more rounded edges, for example. Sleeve variations range from subtle color tinting to degrees of thickness (sometimes the older, translucent, and even more brittle plastic sleeves can be a collectable asset). And yes, you can successfully take a dispenser apart and put it back together! As you browse through the Vintage galleries, you may notice either a small pin hole toward the back of the head, or a larger circular indentation. Metal pins were used in the production of very early character dispensers. Plastic indentations - molded into the head itself - replaced the metal pin. Some older dispensers - like Donald Duck and Pluto - can be found with this indentation visible. That mechanism - which essentially functions the same today - is now fully concealed. Molded onto the very back of the head is the candy pusher: a small tab that tilts forward to "dispense" candy as the head is being tilted back. To help grip the dispenser, some heads have a thumb tab molded on the back as well. 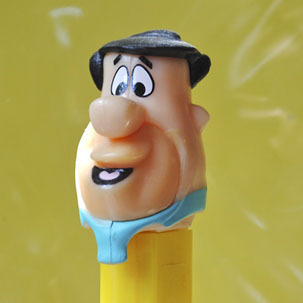 Simply put, "vintage" is recognized by collectors as dispensers made from the 1950s, up until 1987, the year when PEZ inc. began to attach "feet." Be sure to check out my vintage galleries spanning those decades! 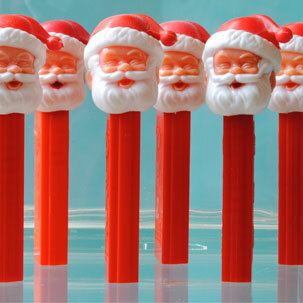 Shown here are a tribe of Santa "C" dispensers. Beginning in the 1970s, these were produced for several decades, so it's not unusual to find footed versions as well. Times flies, and even those dispensers you remember from just a decade (or two) ago may now be retired. Even some of the more popular licensed characters get makeovers, making their previous releases obsolete! You never know what treasure you might have! Shown is (a dusty) Fred Flinstone, produced in the mid 1990s. It seems like you can buy PEZ almost anywhere. That wasn't always the case, and even with "currents" there is still the thrill of hunting down the latest releases. The real challenge is trying to find limited regional releases (like store chain trucks and sports teams), as well as European and Asian dispensers. 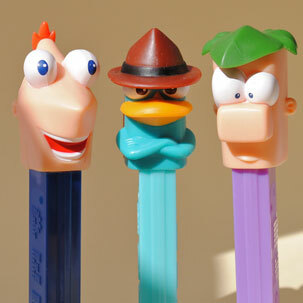 Shown is the Phineas and Ferb trio released in 2011. All images, graphics, and photos copyright ©2012 by Gregory S Paxton. PEZ ® is a registered trademark of PEZ Candy Inc. 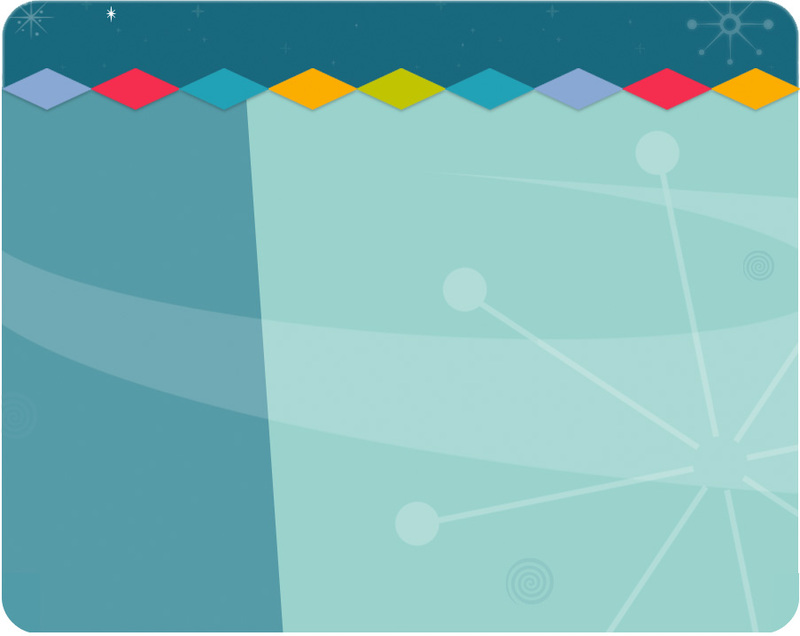 This site and its contents are not affiliated with PEZ candy Inc.